For other uses, see Tunic (disambiguation). 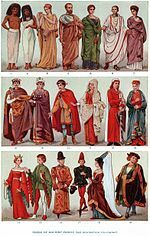 A tunic is a garment for the body, usually simple in style, reaching from the shoulders to a length somewhere between the hips and the knees. The name derives from the Latin tunica, the basic garment worn by both men and women in Ancient Rome, which in turn was based on earlier Greek garments that covered wearers' waists. Indus valley civilization figurines depict both women and men wearing tunic like garment. a terracotta model called ''Lady of the spiked throne'' depicts two standing turban wearing men wearing what appears to be conical gown marked by dense series of thin vertical incisions that might suggest a stiffened cloth. A similar gold disc in al-Sabah Collection from Kuwait National Museum which appears to be an Indus valley civilization arts depicts similar conical tunic wearing men holding two bulls by their tails under a pipal tree shown in a Indus like mirror symmetry.. A mother goddess figurine from National Museum new Dehli shows a female wearing short tight tunic..
"... the way they dress is astonishing: they wear brightly coloured and embroidered shirts, with trousers called braccae and cloaks fastened at the shoulder with a brooch, heavy in winter, light in summer. These cloaks are striped or checkered in design, with the separate checks close together and in various colours." 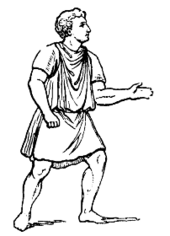 Tunics were also worn in ancient Greece, whence the Roman version was adopted. Later Greek and Roman tunics were an evolution from the very similar chiton, chitoniskos, and exomis all of which can be considered versions of the garment. In ancient Greece, a person's tunic was decorated at the hem-line to represent the city-state in which he lived. Tunics might be dyed with bright colours, like red, purple, or green. The Roman tunica was adopted by the Roman citizens in the 3rd century BC. It was often worn by citizens and non-citizens alike; citizens, though, might wear it under the toga, especially at formal occasions. The length of the garment, the presence or lack of stripes, as well as their width and ornamentation, would indicate the wearer's status in Roman society. Roman senators, for example, used the Laticlavus, with broad purple stripes, and members of the equestrian class wore the Angusticlavia, with narrower stripes. Soldiers, slaves and manual workers generally had tunics to a little above the knee; those in more sedentary occupations to about the ankle (unless they were expecting to ride a horse, when a shorter one would be worn). 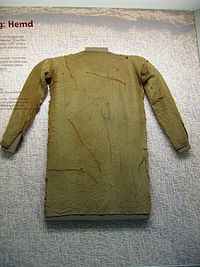 The various Celtic and Germanic peoples living in the colder Middle and Northern Europe wore long-sleeved tunics from as long back as pictorial evidence goes. 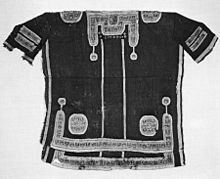 Such tunics are often found depicted on the various Roman monuments depicting victories over these peoples, and show the tunic as a simple pull-over construction reaching to the mid-thighs or to the knees. 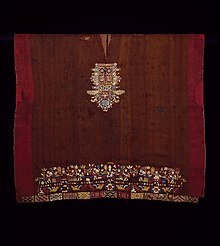 Similar tunics were eventually taken up by the Romans, and continued to be used into the Byzantine period. 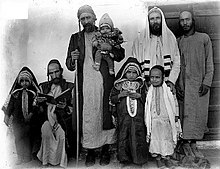 In Western culture, its use continues primarily in a religious and uniform context. It is the primary garment worn by the clergy and members of religious orders. The religious tunic reaches to the feet and was the source of the clerical cassock, as well as, in its liturgical form, the alb, after the long tunic worn by Roman citizens. 'Tunic' is also the name often given to the high-collar uniform coat worn by military and police personnel. Light feminine garments, especially for sports or exercise, usually only coming down to mid-thigh, are also called tunics. ^ Vidale, Massimo (2011). "The lady of the spiked throne, The power of a lost ritual" (PDF). harappa.com. Retrieved 3 December 2018. ^ "National Museum, New Delhi". nationalmuseumindia.gov.in. Retrieved 2018-12-02. ^ Zia, Batool. "Dare to be Different? Try a Kurti or Tunic". www.easternthings.com. Retrieved 15 April 2015. ^ "The Celts". www.ibiblio.org. Retrieved 23 March 2018. ^ "Diodorus Siculus, Library of History - Exploring Celtic Civilizations". exploringcelticciv.web.unc.edu. Retrieved 23 March 2018. ^ Bastús y Carrera, Vicente Joaquín (2008). Tratado de declamación o arte dramático. Madrid: Editorial Fundamentos. p. 253. ISBN 9788424511326.